– but Kilimanjaro in Tanzania remains the most popular. For charity treks, personal challenges – and I have even arranged a few stag parties (!). However there are a few things that you need to remember when embarking on a trip to the Roof of Africa…..
1) Book with a reputable operator – I cannot emphasise this enough and this is definitely the most important factor when you are considering this challenge. Having fallen foul myself of landing in Moshi (at the base of the mountain) and recklessly agreeing a price with a local ‘operator’ then finding myself wandering alone up the mountain (not sure where the ‘guide’ was most of the time), eating disgusting so-called food en route, being urged to get to each camp as fast as possible in order to grab a bunk in the huts, reaching the crater rim by myself at 6am and not knowing how to get to the summit (once again the guide had disappeared) and then being virtually held to ransom as the crew did not consider my ‘tip’ to be generous enough, I would never ever suggest following this route again unless you had undertaken some serious research. It costs a lot of money and time to reach Kilimanjaro and you do not need to be worrying about the people whose hands you are effectively putting yourself in. So book with a company who are experienced at the trek itself, are fully bonded, comply with Porter’s Rights and who you feel comfortable with. 2) Choose your route carefully – there are a huge variety of routes to choose from, all with different attractions. 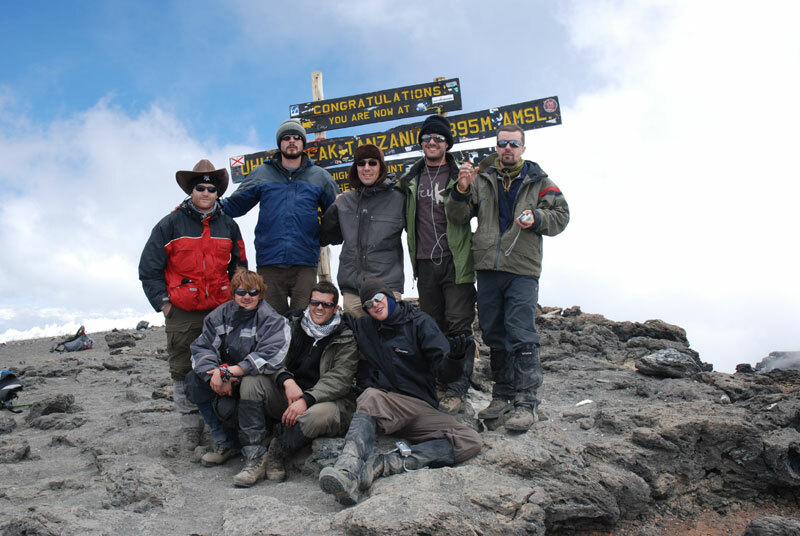 Briefly, the most popular is the Marangu Route which is the only route that offers hut accommodation on the mountain. The benefits are having a solid roof over your head each night and a group camaraderie approach. However it is busy which brings with it issues of hygiene and actually enjoying the mountain scenery whilst being surrounded by a constant flow of trekkers. Plus there really is little difference between a basic ‘four walls and a roof’ hut and a perhaps more cosy tent. The Marangu Route offers the benefit of spending less time on the mountain (it can be a five day trek if no extra days at Horombo Hut are included) and thus cheaper as the national parks charge a daily rate. However, this benefit can be outweighed by a possible lack of acclimatisation. The little-known Rongai route offers the quietest route to the top enjoying secluded campsites and a gentle approach taking six days following an undulating gradual ascent through beautiful and varied scenery. Descent is usually via the Marangu Route. Possibly the most challenging is the Shira Route due to the terrain – the final ascent is via the Western Breach, which is susceptible to rockfall. This is probably the most spectacular approach however, as Kilimanjaro’s glaciers rise imposingly towards the end of your climb. Other routes include the Machame, Umbwe and Lemosho. 3) Add extra acclimatisation days – as mentioned above, often people choose the Marangu route as it spends the least amount of time on the mountain and the park authorities charge a daily fee. However, do remember you are here to summit and by adding acclimatisation days you give yourself the best chance of reaching the top not only safely but also having enjoyed the experience (relatively speaking). It is possible to add extra acclimatisation days on any of the routes – I added an extra day at Horombo Hut for example and took a day trek to Mawenzi Peak following the old climbing adage “Climb high, sleep low”. 4) Pick your season – the two most popular seasons to climb Kilimanjaro unsurprisingly coincide with Tanzania’s dry season, namely January-March and June-October. The former tends to be slightly colder but this means mountain views are clearer. This season is also quieter than the latter period which is when the long holidays of July-August attract larger numbers. Bringing in the New Year atop the highest point in Africa is a popular time too! 5) Take the right gear – do not turn up naively assuming trainers and a lightweight waterproof will do. I ended up borrowing boots (a huge ‘no-no’ from any walker’s perspective) and putting socks on my hands for gloves. Get some decent footwear with ankle support, thermals, fleece, outer waterproof top and bottoms (it can rain at any time don’t forget but even if it doesn’t, waterproof means windproof, which means warmth plus the usual gloves, thick socks, hat/balaclava etc….For extras my top three would be a head torch, trekking poles and a water bottle. 6) Pole pole – a phrase you will hear a lot of. It means ‘slowly, slowly’ in Swahili. I was lucky, I walked at my usual pace and didn’t suffer from altitude related issues such as headaches and nausea. Most people aren’t so lucky but walking slowly will definitely aid acclimatisation. 7) Drink lots – water not alcohol! Again, I truly believe this helped me acclimatise as I drank like a fish on the mountain, which has its obvious negative side effects too…! Leave that bottle of beer/champagne for the summit down at the base as I promise you will not feel like it at the top. 8) Add Zanzibar or a safari to your trip – why go all that way and spend it on a mountain which, within reason, could be anywhere once you are a few days into the trek and through the tropical forest zones. You’re in Africa so the world is your oyster. If phrases such as ‘the Big Five’, ‘Serengeti National Park’, ‘the Ngorongoro Crater’ and ‘the spice island of Zanzibar’ don’t get you excited then I would just stay at home. Make the most of the expensive airfare and take a safari followed by a jaunt up Kilimanjaro then chill out time on Zanzibar’s beaches. Bet no-one back home has packed so much into two and half weeks. 9) What to keep in your sleeping bag overnight – apart from you that is. Sounds odd doesn’t it, but at the higher camps it will fall well below freezing at night and water and batteries don’t fare too well at those temperatures. Tuck your camera, head torch, iPod, water bottle and anything else susceptible to cold into your bag, and although you will feel like a sack of potatoes when asleep, at least everything will work the following morning. Did you hear about the Everest cameraman who has his summit shot taken on a cheap disposable camera as it was the only one that was still working….?! 10) Leave old walking gear with porters – a nice touch and one always appreciated. Better still why not take unwanted boots and waterproofs out with you? So that’s Kili in a nutshell. Now go climb it and offer real boasting power down the pub on your return. Author: This guest post has been written by Helene Cooper who is a keen globetrotter and has spent much of her life trekking and climbing on all seven continents including summitting Aconcagua in South America, climbing live volcanoes in Ecuador, getting engaged at Everest Base Camp and honeymooning amongst the stunning mountains of New Zealand. Helene currently writes for Dragoman. Great Article about Mt.kilimanjaro, Love to go one day.Thank you for nice information sharing. I would love to visit Kilimanjaro one day. It’s on my bucket list. Thanks for the inspiration – definitely something I want to do! All of those are super important. But I think that acclimatisation days and drinking water are the most important. I love just this! I wish I could do this trek at least once in my lifetime. I’m not going to trek Mt. Kilimanjaro, but I am getting into trekking and some of these will be useful. Thanks for sharing.